Sudan has agreed to a revised plan for a joint UN-African Union (AU) peacekeeping force to be sent to war-torn Darfur, AU sources say. Under the new plan, the AU will run day-to-day operations, while the UN is expected to have overall control of between 17,000 to 19,000 peacekeepers. 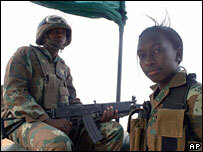 However, there remains some doubt as to whether Sudan would allow peacekeepers made up of non-African troops. The current AU force of 7,000 has struggled to contain the violence. UN Secretary General Ban Ki Moon has hailed the agreement and stressed the need for an immediate comprehensive ceasefire in the strife-torn region, AFP news agency reports, quoting a statement by UN spokeswoman Michele Montas. Sudan's foreign minister said that Sudan would accept non-African troops in Darfur, but US officials are sceptical. Sean McCormack, US State Department spokesman, said: "President Bashir has made promises before about accepting an AU/UN hybrid force, but there's always the fine print". He said it would be difficult to get enough African troops to go to Darfur because "the assets simply aren't there". "So, to say that the force would be limited to only African troops is, in effect, to say that you are not agreeing to the full 17,000 to 19,000 troops," he said. More than 200,000 people have died in the four-year conflict and around two million have fled to refugee camps. The AU and UN presented their revised peacekeeping plan at talks in Addis Ababa. The new plan has been created to get round the objections of the Sudanese government, which does not want a solely UN force, which it says would be like a Western invasion of their country. "In view of the explanation and clarification provided by the AU and the UN as contained in the presentation, the government of Sudan accepted the joint proposals on the hybrid operation," AP news agency quotes Said Djinnit, the AU's top peace and security official, as saying. The BBC's Elizabeth Blunt in Addis Ababa says the mood was cheerful at the AU headquarters after the announcement was made. A timetable for the deployment of the force was vague, she said, and will not be before next year. "This is a unique situation of a hybrid operation and we are most likely going to face some difficulties on the ground, but with the spirit of co-operation we are confident," Mr Djinnit told the BBC. "We came a long way together not only as the AU and UN but also in working with the government of Sudan. As far as possible the African character of the mission should be preserved, Mr Djinnit said. Our correspondent says the actual composition of the force was not part of the agreement - this will be the next stage in the process. But from Mr Djinnit's comments it is expected that it will be made up mainly African or Asian soldiers, with possible Scandinavian expertise. No US or UK soldiers are likely to be part of the operation, our reporter says.